With university costs higher than ever studying abroad has become increasingly popular with over 37,000 students currently studying overseas. The only annually updated guide to studying overseas with the most up-to-date information for students making their university choices. Covers the most popular areas to study overseas including Europe, Asia, Australia, New Zealand, Canada and the USA, plus less common locations for inspiration. 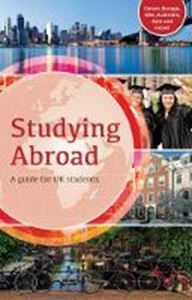 Accurate and accessible - covers the pros and cons of studying overseas in each area, including real-life case studies from students currently there.